EN1755:2015 is the standard by which conversion companies, like Pyroban, convert forklift trucks, so that they are safe for operation in hazardous areas. 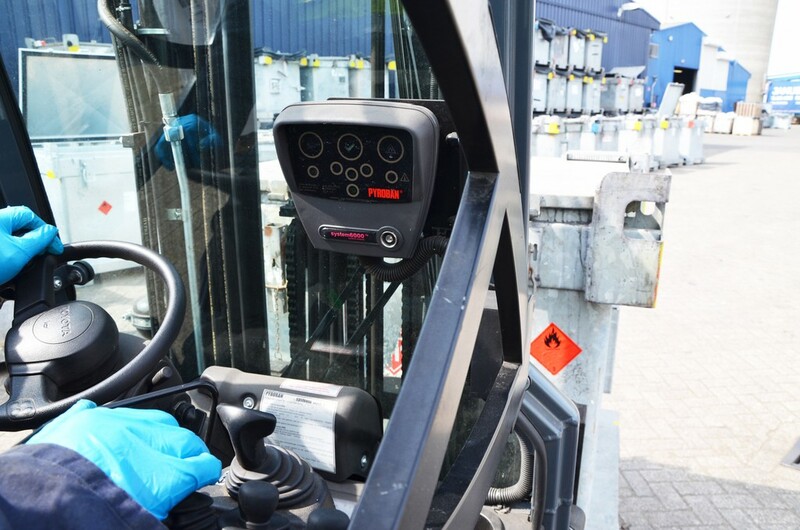 A spark from unprotected electrical equipment on a forklift, excess heat from the engine, motors, brakes and other components, and even a spark from static build up can create enough energy to cause ignition. 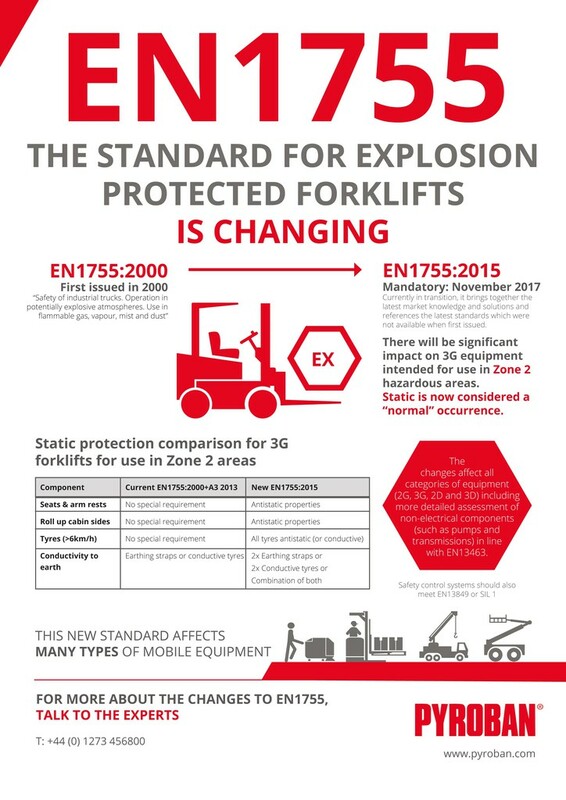 The update to EN1755:2015 titled: “Safety of industrial trucks. Operation in potentially explosive atmospheres. Use in flammable gas, vapour, mist and dust,” brings together the latest market knowledge and solutions and references the latest standards which were not available when first issued in May 2000. Static electricity will now be considered an ignition risk during 'normal' operation, therefore seats, arm rests, roll up cabin sides and other externally accessible plastics need to be antistatic as a minimum. All tyres (where travel speeds are >6km/h) on 3G trucks should now also be antistatic and there must be conductivity to earth either with two straps from the chassis to ground or by using conductive tyres. The location and quantity of conductive tyres or earthing straps should also be marked on the chassis. For Zone 2 applications, the new EN1755:2015 requirements have maintained the core principles of the current standard and brought them into line with relevant latest standards. Gas detection is still included, but performance requirements are strengthened to achieve Performance Level PLc (EN13849) or SIL 1. Testing has also been redefined for Ex nR restricted breathing enclosures which require stronger leak performance. Truck labelling has also been re-defined and the handbook requirements are more detailed. Changes that affect all categories of equipment (2G, 3G, 2D and 3D**) include more detailed assessment of non-electrical components such as pumps and transmissions in line with EN13463***. Safety control systems should also meet EN13849**** or SIL 1. For load handling devices such as forks or clamps, the areas requiring cladding are redefined and brass, not stainless steel, should be used where the flammable material is in the IIC gas group. 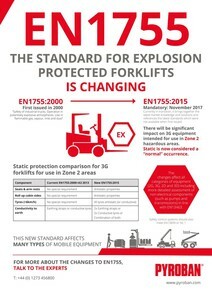 EN1755:2015 is introduced in the wake of an update to the ATEX Directive and ISO 3691-1:2011 which clearly states that with regards to safety, unauthorised truck modification is not permitted and that no alterations should be made without the prior written approval of the original truck manufacturer. Are you ready for new tyre requirements?